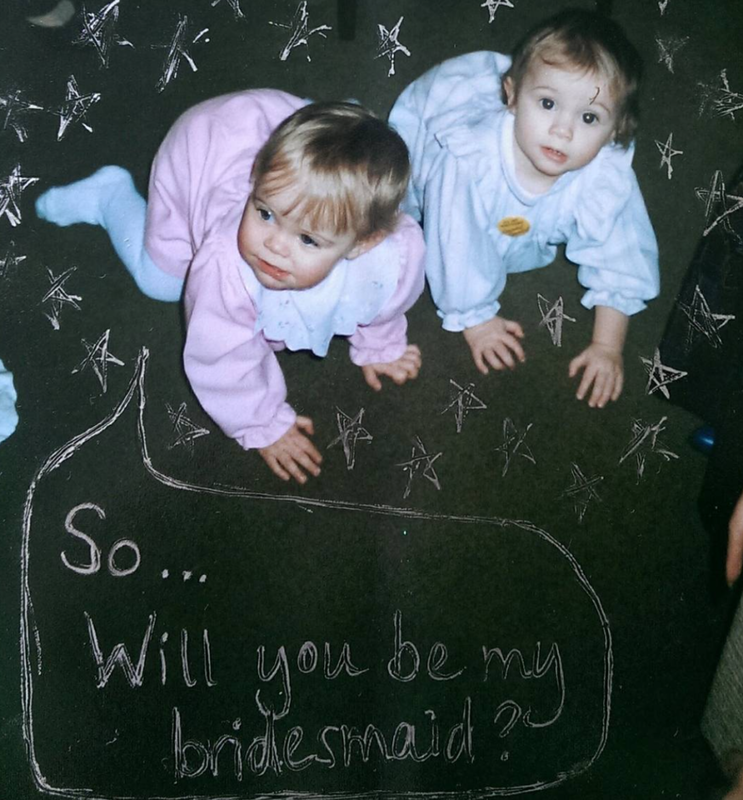 I’ve been lucky enough to be a bridesmaid three times over and know the responsibilities it brings with it; being there to offer moral support every step of the way, making sure the bride-to-be gets completely drunk on her hen do, and helping them pee in their ginormous wedding dress on the big day itself. I’m a pro. And now it’s time for me to turn the tables. Despite the fact that we haven’t yet booked a date for our wedding or the hotel in Antigua that we’d like to get married in, I knew exactly who I wanted to walk down the aisle beside me and wanted to ask them as soon as I could. This involved pulling out the photo albums and finding the perfect photo of us together. There was no question of a doubt that my big sis wouldn’t be asked. Way back when I was 6 I rocked a puffball-sleeved number as she married my now brother-in-law. She’s super thoughtful, caring and ridiculously organised and I know will be there to help get things moving for me. Case in point, she’s already sending me links to potential wedding favours. With only ten hours between us in age my little cousin Gem was also a sure-fire bet. From matching outfits, to some hen-do memories which can’t be repeated because my memory has been wiped, we’ve been side by side, resulting in me working a 50’s glam outfit as I sobbed my way down the aisle as her bridesmaid last October. She’s like my extra sister, is a ruthless haggler, a seamstress and very crafty. When I told her the news she burst into tears, promptly causing me to do the same, meaning I won’t be able to look her in the eyes on the big day. I’ve known Sophie since year 7 and the trouble hasn’t stopped since. We’ve shared every first together and have had a constant giggle doing so. She’s determined, feisty and always looking out for me. She married her husband a few years ago and I felt honoured to have been one of her bridesmaids. As one of my besties, there’s no-one I’d rather have there with me. There is no one who knows my style and taste better than my fashion partner in crime, Chez. Neither of us can pinpoint the exact moment we first became friends but are pretty sure it all winds back to rugby-club days and boys. We’ve organised a charity fashion show together, our boys are best friends and can borrow each others clothes. Chez is a one-of-a-kind friend who can pretty much read my mind and who always puts others first. She’s already started collating wedding dress inspiration for me. I can’t wait to share this magical journey with them all. P.S Just remember bridesmaids, what happens on hen, stays on hen. P.P.P.S I’m the blonde with the upturned nose and my cousin is the chocolate-box brunette. Previous Post Socks and Shoes: Yay or Nay?